For a look at Golden Bear Cottages prices check here. Accommodations for 20 to 200 guests. 28 cottages from 1 to 7 bedrooms. central heating for the cooler months. A wooden deck with gardens, for outdoor yoga practice or meditation. Five acre Big Bear Lake retreat property, AAA approved and diamond rated. Meetings, weddings, getaways for Yoga, Quilting, Scrapping and Knitting retreats. 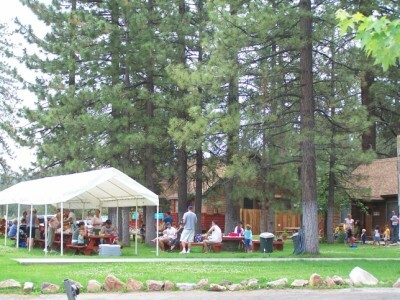 Special Discount Group Rates on world famous big bear cabins. Five acre Big Bear Lake retreat property, AAA approved and diamond rated. Meetings, weddings, getaways for Yoga retreats, Quilting retreats, Spiritual retreats, Family reunions, groups and conferences. * Special discount group rates for spiritual retreats. Top Company Rating Big Bear Golden Bear Cottages AAA Diamond Rated. Rating Explanation: Better Business Bureau and AAA rating assigned to this resort cabin lodging business is determined by our composite score of such factors as the type of business, length of time in business and superior level of compliance for retreats..
Did you know that over 60% of our Groups and retreats are returning guests and referrals? 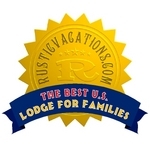 We hope to make you a member of our family of satisfied retreat customers too! "Reviewed by our group today, "The Golden Bear Cottages was the perfect location for our Middle School and High School Winter Retreats!" Our Review: We brought a group of 50 Middle School students one weekend and a group of 50 High School students the next weekend, and the location was perfect! The staff was friendly and helpful, the cabin accommodations were the perfect blend of rustic charm and modern amenities, and the kitchen in the big cabin was large enough to cook for over 70 people! This is a great place for a group retreat! Our church group stayed twice in February 2015. We traveled with family and friends and these are our review ratings: *****5 of 5 stars for Golden Bear Cottages Location. *****5 of 5 stars for Golden Bear Cottages Sleep Quality. *****5 of 5 stars for Golden Bear Cottages Service. *****5 of 5 stars for Golden Bear Cottages Value." ... Golden Bear Cottages offers 20% off discount boat rentals or ski tickets with any groups 2 day or longer mid-week lodging reservations: Meetings, Team travel, weddings, getaways for Yoga, Quliting, Scrapping and Knitting retreats. Sleep on the most highly recommended comfort on Tempur-Pedic queen beds. Golden Bear Cottages Retreat. 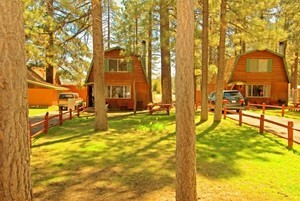 Five acre Big Bear Lake retreat property, AAA approved and diamond rated. Meetings, spiritual retreats, weddings, mountain getaways. Special Discount Group Rates. Phone 800-461-1023 or email. Visit goldenbear.net today to see why this beautiful retreat; AAA approved rustic cottages that are very often the preferred choice when you're staying in Big Bear Lake. Big Bear Lake is Southern California's only four-season resort, ... More than 6 million visitors recreate on the San Bernardino National Forest every year in Big Bear Lake. Over 25,000 of them choose to stay in a rustic mountain cabin at AAA approved Golden Bear Cottages Resort at 39367 Big Bear Blvd. only a block from Big Bear Lake.